System is about six months old. All wifi networks disappeared as well as any evidence in Win10 that there was any wifi hardware installed. Did all the normal rebooting of system and router to no avail. Since it was under warranty, took to the the seller. Worked fine there and when I returned home. My conclusion is an intermittent short on the system board. Is this a plug in module that can be reseated? I can't find any kind of useful system board schematic on the HP support site. May the Forums be with you! It is a great place to find the help you need, from other users, HP experts, and other support personnel. I understand that you suspect an intermittent connection is causing WiFi issues at home. I am happy to help with this. 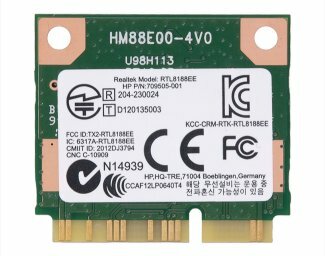 Looking at the HP Slimline 450-a120 Desktop PC Product Specifications, the wireless connection is provided by the PCI express half-length mini card shown below. With the power off, and unit unplugged you could try removing and then inserting the card again, to see if that helps. Thanks ever so much. Since system is continuing to work just fine I have printed solution and filed it with paperwork that came with system. Nice to know that a retired network guy hasn't lost his troubleshooting senses. But I am finding it a bit harder to find good documentation for newer systems. So thanks for the extra leg work.